Goba Rest Camp's is nestled underneath two big trees, 200 meters from the lodge buildings. The rooms open up on a pathway leading to the entertainment area with a sitting room, dining tables, channel T.V., equipped kitchen and barbecue. Goba Lodge is situated on the banks of the Black Nossob River, only 1km away from Gobabis, and offers a choice between luxury single, double and family units. All rooms are en suite with air-conditioning, channel T.V. and a coffee/tea console. Selected rooms are equipped with a telephone and fridge. The rooms open up on Goba's beautiful and peaceful garden. 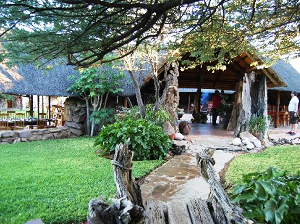 Goba Lodge is renowned for serving excellent food and creating unforgettable experiences. Harnas provides a wide variety of accommodation for its guests. There are comfortable rustic chalets and luxury rooms with air conditioning, en-suite bathrooms. There are also camp sites available with ablution blocks or bush camping for the more adventurous. Waking up with the roaring bush call of the lions, grazing springbok on the airstrip, a soft cat rubbing up against your leg, a chirping pack of mongooses feeding on the lawn or a menagerie of other surprises that awaits you around every corner. The lapa is like no other as one is greeted by a multitude of creatures big and small that live around the area. One can participate in guided tours to view the various animal feedings. There are also game drives, Life Line tours to get a first hand insight into rehabilitating animals, a swimming pool to cool down on the sizzling African afternoons, and sundowners to salute yet another day well spent. Ronnie and Elsabe Barnard, regard themselves extremely privileged to be given the opportunity to work with the rhythms of nature and exploring their dreams with the natural beauty of Africa as their palette. 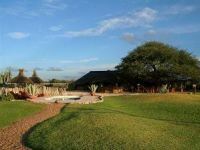 At Elandsbult Guest House you are surrounded by primordial, enthralling savannahs while the ambience of the guest house itself is both natural and luxurious. The garden is shaded by worm-barkfalse-thorn trees and overlooks a floodlit waterhole where game and birds flock during the day. 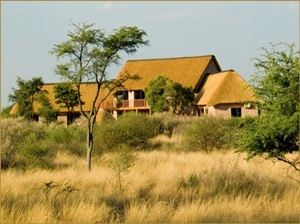 The three-leveled thatched complex and 2 Chalets can accommodate up to sixteen people sharing. There are eight bedrooms, two which are equipped with double beds, and all have en-suite bathrooms. The partly covered lapa can be referred to as the "heart" of the guest house with open fireplace, a kitchen and bar facilities. Each of the 10 camping site has its own fireplace and braaigrid with an electric light and 15 amp plug point. Knowing that needs differ, the lodge offers a choice of four accommodation types: Luxury chalets, cozy thatched rooms, comfortable tented chalets, private camping sites. For leisure, choose between lounging by the poolside, taking a swing on the golf driving range or simply having some family fun at the putt-putt course. A small gym is available for the fitness conscious and our walking trail will leave you stress free. Experience the breathtaking sunset from our sundowner deck or relax in the lounge area. Whatever your choice, the lodge offers what your heart desires.